When, in December 2016, Derek MacKay set out the 2017/18 Scottish Budget (the first of this parliamentary session), the Scottish Government’s block grant from Westminster was expected to fall by 2.6% in real terms over the period to 2019/20. But since then, the Prime Minister has promised an end to austerity. 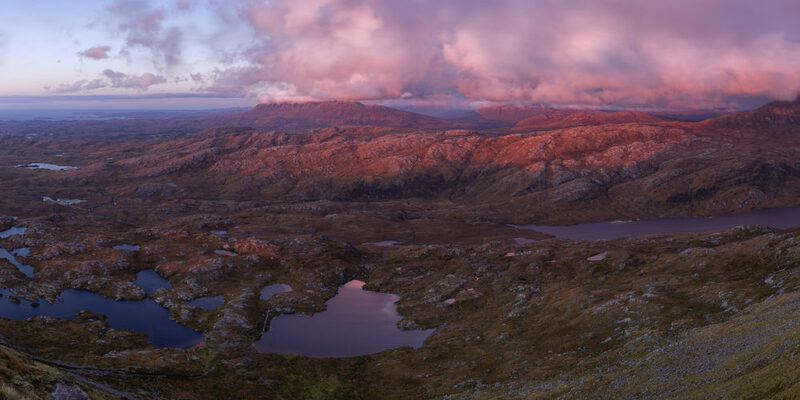 What might this look like and what might be the implications for the Scottish budget? Following that 2017/18 Scottish Budget, the UK government announced modest spending increases at UK budget events during 2017. 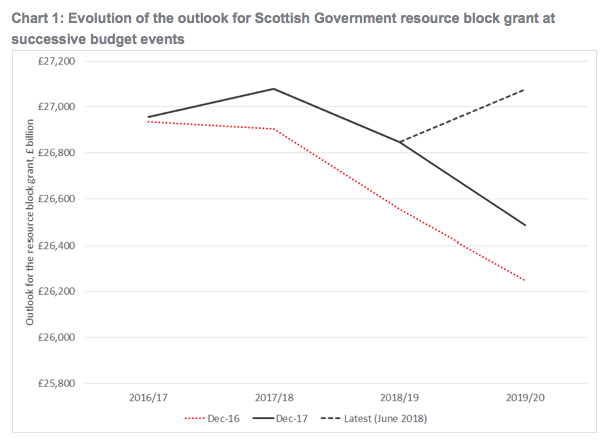 As a result, by the time Mr.Mackay set his 2018/19 budget in December 2017, the outlook for the block grant in 2018/19 had improved by almost £300m compared to 12 months previously (see Chart). The outlook for the Scottish block grant in 2019/20 improved again in June this year when the UK Government announced significant extra funding for the NHS in England. Relative to previous plans, spending will increase by £6bn in 2019/20 rising to £23bn by 2023/24. All else equal, this will generate a consequential uplift in the Scottish Government’s block grant of around £600m in 2019/20 rising to £2.3bn in 2023/24. On the basis of the latest figures therefore, the resource block grant is expected to be slightly (0.4%) higher in real terms in 2019/20 than it was in 2016/17. Will the UK budget on Monday signal further changes to the outlook for the Scottish budget? First, how will the Chancellor fund the commitment to substantially increase spending on the NHS over the period to 2023/24 announced in June? Second, how will the Budget address Theresa May’s commitment at the Conservative Party conference that austerity is over? The answers to both of these questions will have implications for the Scottish Budget when it is published on 12 December. Funding the NHS commitment – a decision postponed? When the UK Government’s NHS spending plans were announced in June, there had been an expectation that the UK Government would need to announce tax increases in its forthcoming Budget in order to fund this pledge whilst keeping to its fiscal rules. An increase in UK income tax rates (or a freeze in one or more thresholds), could have created difficult challenges for the Scottish Government. Tax changes by the UK Government that increase rUK income tax revenues can reduce the scale of any consequential uplift in Scotland’s block grant. The rationale for this is straightforward. Scottish taxpayers should not benefit from a UK Government spending increase where that has been funded by a tax increase that applies to rUK taxpayers only. In this case, it is up to the Scottish Government to decide whether to implement an equivalent tax (and spend) increase in Scotland. However, it now looks much less likely that the UK Government will announce any income tax rises in this Budget. UK tax receipts over the first half of the financial year have performed significantly more strongly than had been forecast. As a result, OBR forecasts for the UK deficit in 2018/19 are likely to be revised down by around £13bn on budget day, with these improvements in the outlook being replicated in future years too. The improvement in the public finances since the summer means that the NHS funding commitments can be funded in 2019/20 without tax rises – and with the UK Government remaining on course to meet its fiscal mandate (that the cyclically adjusted budget deficit should remain below 2% of GDP in 2020/21 and beyond). This fact, together with a variety of other economic and political constraints facing the Chancellor (ongoing uncertainties around Brexit negotiations, frictions within the Conservative Party, and the government’s weak parliamentary majority) means that decisions around how to fund the NHS commitment in subsequent years are likely to be postponed for future budgets*. At the Conservative Party conference at the start of October, Theresa May announced that ‘a decade after the financial crash, people need to know that the austerity it led to is over and that their hard work has paid off’. There are a variety of ways that ‘ending austerity’ could be defined, and it remains unclear exactly what the Prime Minister meant. One loose interpretation could be that an end to austerity will simply be a move away from an immediate focus upon reducing the deficit. But of course, this does not mean that some services and individuals will be immune from further cuts (and it would not be compatible with the Conservative Party’s Manifesto commitment to eliminate the budget deficit by the mid-2020s). On a broader definition, the Resolution Foundation estimates that a commitment to end austerity in the next Spending Review period could require funding increases of £24bn, £26bn or £31bn annually by 2022/23, depending on whether ending austerity is defined as ensuring no department faces real terms cuts, no department faces per capita real terms cuts, or all departments maintain their spending as a percentage of GDP at 2019/20 levels. Any further spending increase relative to previous plans would generate consequentials for the Scottish budget. Additionally, many will argue that ‘ending austerity’ should also involve cancelling the final year of the four year freeze to most working age benefits (in 2019/20) and cancelling planned cuts to Universal Credit, adding around a further £5bn to the costs of ending austerity in 2022/23, bringing the cost of ‘ending austerity’ to between £29bn – £37bn by 2022/23 (in line with the RF estimates, the IFS estimates the cost of ending austerity at £41bn by 2024/25). Strictly speaking, given the improvements in the outlook for borrowing, the government could probably accommodate this scale of spending increases without raising taxes and whilst remaining within its fiscal mandate. But, by running an annual budget deficit equivalent to 2% of GDP, the government would fail to meet its debt rule (which is for public sector net debt to be falling as a share of GDP in 2020-21). Moreover, it would put the government on course to breach its Manifesto commitment to eliminate the deficit entirely by the middle of the 2020s. In short, ‘ending austerity’ is possible with significant but not unrealistic spending increases. What makes a promise to end austerity politically difficult is that it cannot be achieved without tax rises if the government is to keep to its fiscal rules and commitments. As already noted, the Chancellor is likely to avoid any major tax increases in this budget. But he has committed to setting out the size of the ‘spending envelope’ for next year’s Spending Review. Where do these predicaments leave Mr. Hammond? He could set out a spending envelope that delivered on a promise to end austerity, while leaving decisions on how this envelope can be funded to next year’s budget – by which time he will hope that Brexit negotiations give him a stronger hand to play with. Alternatively he could prioritise fiscal rules and manifesto commitments over conference speech promises, cementing his reputation for prudence with a more modest concession to ‘ending austerity’. All of this leaves the outlook for the Scottish budget fairly uncertain, particularly beyond 2019/20. The outlook for the Scottish block grant has already improved during the first half of the parliament. But we will have to wait until Monday before we know whether austerity is truly over. * However, as well as income tax policy, it will also be important to keep an eye on the income tax forecast for rUK. Based on interim outturn data, the OBR’s forecast for rUK income tax in 2018/19 and beyond will almost certainly be revised up. Under the rules of the Scottish Fiscal Framework, this will result in the forecast for the Block Grant Adjustment (BGA) for income tax being revised up too. The BGA is an estimate of the revenues that the UK Government has foregone as a result of transferring income tax to Scotland, and is deducted from the Scottish block grant. A higher BGA is not necessarily problematic for the Scottish budget outlook, as long as the Scottish Fiscal Commission revises up its forecasts for Scottish income tax by a similar proportion. The SFC almost certainly will revise up its Scottish forecasts, but we will have to wait until December 12 before we know to what extent any upward revision to the BGA is offset by an increase in the forecast for Scottish revenues.